Cooking with kids is always fun. It's a great family activity, and in fact, science encourages us to let our children cook along with us. As per the researchers at the University of Alberta, the easiest way to get kids to eat healthy food is to give them an apron! As this month is all about Holi, our recipe is also a Holi special recipe. It is the Gujiya Recipe. It's the traditional gujiya presented in a modern way. I kept the steps simple and used a microwave and conventional oven to prepare this recipe. So it's a no-stove recipe. Also, I used the store bought milk powder to make the filling, which makes is easy for the kids to handle. Parental Step: Add the all purpose flour, a pinch of salt and the ghee to a wide bowl. Children Step: Let your kid mix the flour and ghee together. Parental Step: Please ensure the ghee and flour are well combined. Parental Step: Add 1/2 cup of milk in the center. Children Step: Let them mix the flour and form the dough. Parental Step: You can help them to knead the dough. Assist them in preparing a soft dough like this. Parental Step: Now cover the dough with damp cloth and set aside. Parental Step: In a microwave safe bowl, add the milk powder, pistachios, cardamom powder and condensed milk. Children Step: Let them mix the filling and help them keep the filling bowl in the microwave and let it cook for 30 seconds. Parental Step: Remove the mixture from microwave and mix again. Children Step: Help them keep the filling in the microwave again and cook again for 30 seconds. Parental Step: Remove the filling from microwave and mix. The filling is ready now. Parental Step: Now take the dough and pinch small lemon sized balls. Children Step: Let them roll the dough into soft, smooth balls. Children Step: Using a rolling pin, let your child roll the ball into a small round like roti. Help them on a required basis and adjust the shape. Children Step: Let your child spread the edges of the rolled dough with water using their fingertip. 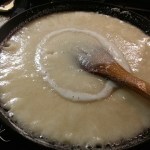 Children Step: Help them take about 1 tbsp of the prepared mawa filling and place it in the center. Children and Parental Step: Carefully bring the edges together and press the edges and form like a semi-circle. Make sure the edges are sealed properly. Using a fork, press the edges to form the striped pattern. Parental Step: Preheat the oven to 400 degrees F. Line a baking tray with parchment paper or aluminum foil. 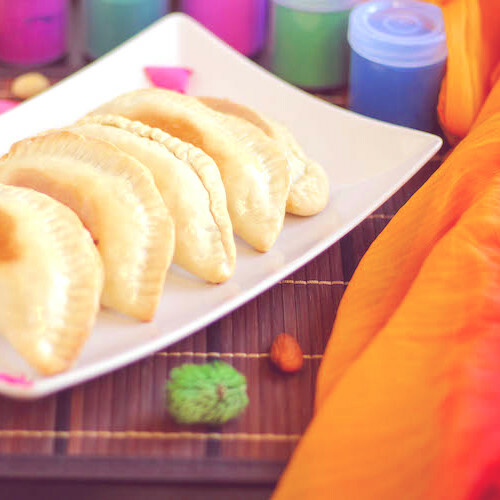 Children Step: Let them place all the prepared Gujiyas in the baking tray and help them brush the top of the gujiyas with ghee or oil using a pastry brush. Parental Step: Place the gujiya carefully in the oven and bake for 8 minutes. Parental Step: Meanwhile the glaze can be prepared. In a small bowl add the 1 tbsp of milk and condensed milk and whisk them well. After 8 minutes, remove the gujiyas from the oven and flip them. Children Step: Let your child apply the condensed milk glaze using the pastry brush on the flipped side. 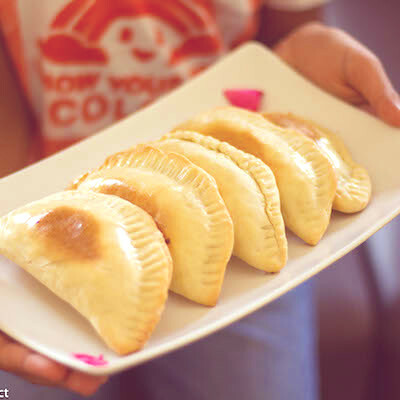 Parental Step: Place the glazed gujiyas and bake again for 8 minutes at 400 deg C.
Parental Step: After 8 minutes remove the gujiyas carefully and flip them again. Reduce the oven temperature to 350 deg F.
Children Step: Let your child apply the condensed milk glaze using the pastry brush on the other side now. Also, add nuts of your choice. Raisins can be included too. During filling and shaping the gujiyas. Kiddo: Ohh, it's like taco amma. Why can't you say like that? Place the filling like in taco and seal the edges. It's simple amma. Kiddo: The filling is so yum amma, why can't we eat just like that? Holi Fun With Ice Cold Thandai! Holi is here and this is one of the popular recipes that are prepared during Holi – Thandai. 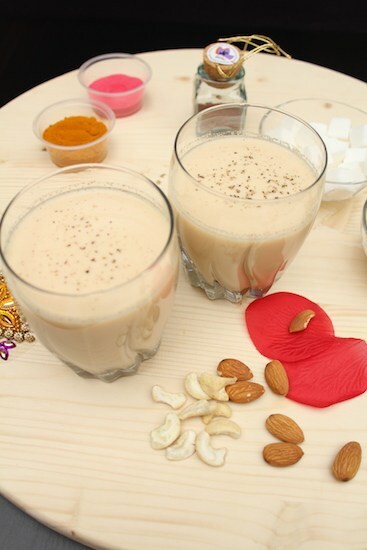 This sweet masala drink is prepared with milk, nuts and flavorful items like fennel seeds, khus khus, white pepper, and saffron and a dash of rose syrup. The main step involved in this recipe is the boiling of milk and letting it cool. And this step requires attention and takes longer time. I followed Tarla Dalal’s recipe but adjusted the ingredients according to our likes and also included the rose syrup and cashews. It is a semi home-made recipe since I used the store bought evaporated milk. Now all I did was to soak the other ingredients and grind them into a smooth paste and mix it with milk. Let it sit for a few hours and drain and serve chilled. Thandai can be prepared well ahead and stored in the fridge along with the masala mix and just before serving depending upon your preference you can drain the milk or serve as is, with the masala. Cool and refreshing Thandai is what you need for quenching your thirst and energizing yourself again to play Holi. To be honest, we like this masala milk very much and we don’t need any occasion for preparing this. Note: You can use regular milk and prepare it in the traditional way too. All you have to do is boil the milk and let it cool before adding the masala. You can either opt for this or go with store bought evaporated milk. 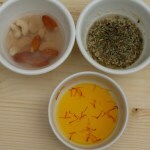 Warm 3 tbsps of water and add the saffron strands and let it soak for half an hour. Soak cashews and almonds for half an hour. Also soak white pepper, fennel seeds and poppy seeds for half an hour. After half an hour, peel the skin of the almond and grind the almond, cashews, fennel seeds, poppy seeds and white pepper together by adding the remaining water. 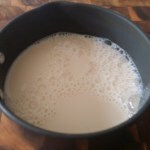 Take the evaporated milk in deep bowl or pan. 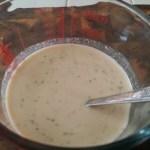 Now add this ground mix into the evaporated milk. 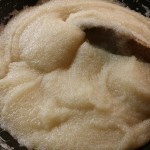 Also add the sugar, soaked saffron water, elaichi powder and rose syrup and mix well. Let it sit in the refrigerator for about 1 to 2 hours so that the masala mix can incorporate well. Evaporated milk can be substituted with regular milk as I mentioned above. Pistachios can be added along with almonds and cashews. As my evaporated milk was bit sweet, I added less sugar. Adjust accordingly. 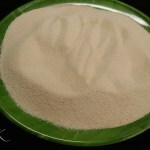 White pepper can be substituted with black. Adjust the masala proportions as per your taste. 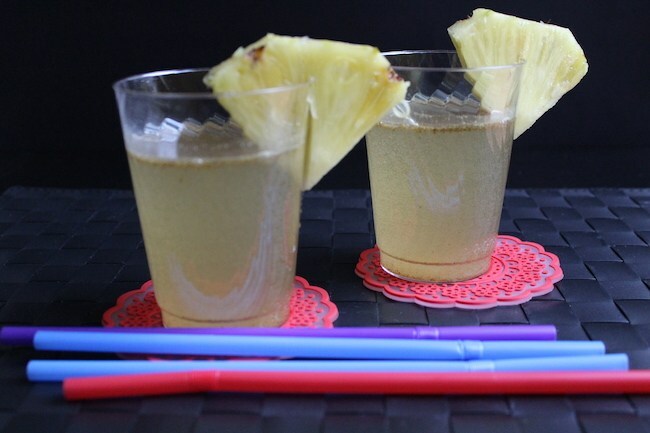 Celebrate Holi with Jal Jeera With a Twist! Last month, when we visited one of our friends, they gave us this amazing and refreshing beverage, but didn’t tell what it was. I had never tasted that before. I guessed it had some Indian spices, but couldn’t guess what exactly it was. And then my friend revealed that it was sprite with JalJeera masala. Holi is always fun and after playing Holi, we all need something refreshing. So how about this Jal Jeera with Sprite or Mountain Dew? Add the Jal Jeera Masala to the sprite and mix well and that’s it yummy refreshing drink is ready. 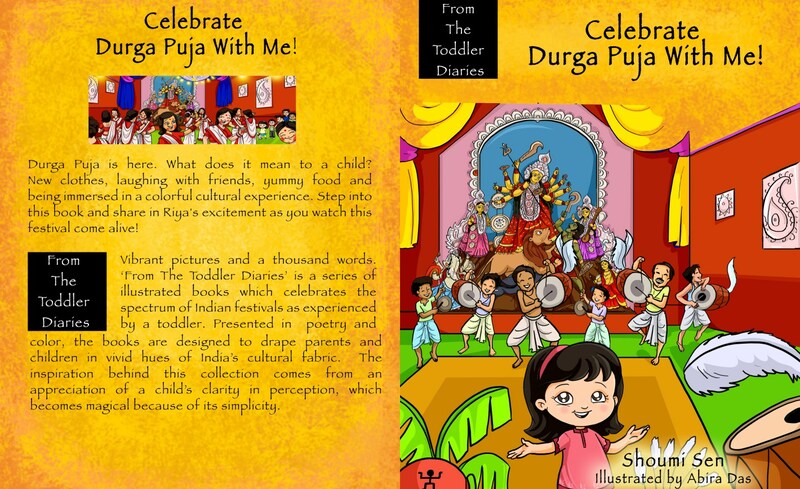 I wish I could be in India for festivals. 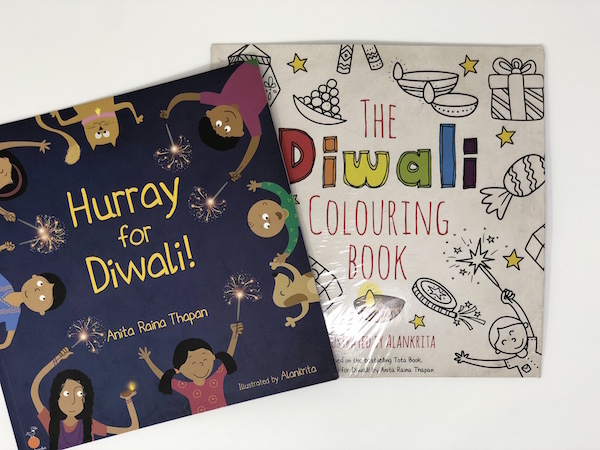 How do I teach about these awesome festivals to my kiddo? 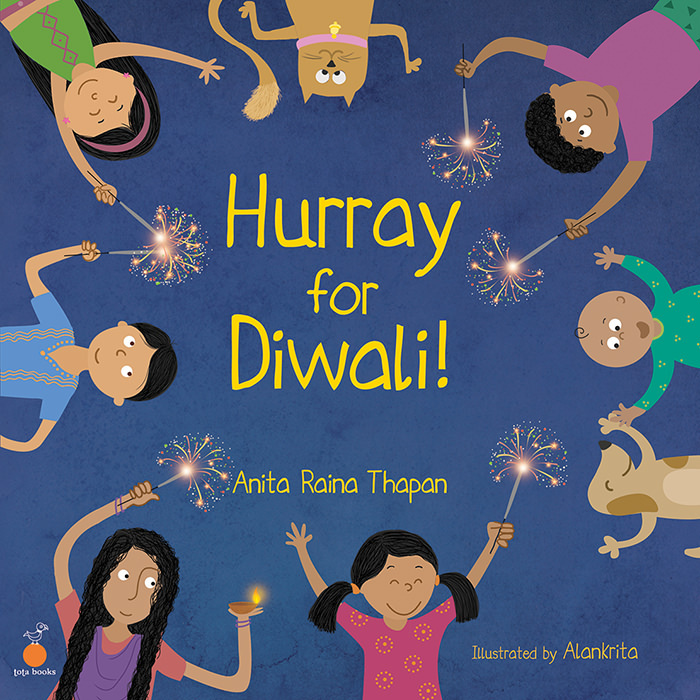 Am I an IBCP (Indian Born Confused Parent) and will my kiddo be an ABCD (American Born Confused Desi)??? Why am I using these terms? I guess, it is the effect of reading “R2I – Dreams For Here Or To Go” and can you believe, I spoke to all the three authors as well and interviewed them. Yes! not one author but three authors. It was a wonderful experience talking to them and to know their thought process behind the book. You can listen to the interview as well! 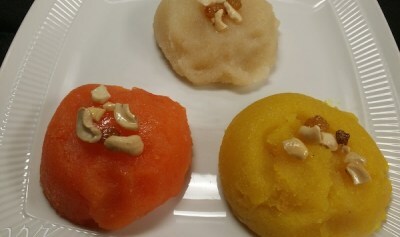 I wanted to try a simple sweet for this Holi under 30 minutes and decided to make this Kesari (Sheera). As it was Holi, I used some edible food colors but that’s completely optional. Roast the rava till it is light brown in color. 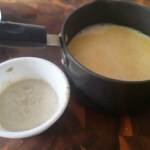 Also add 1 tsp of ghee and let the water boil for couple of minutes. 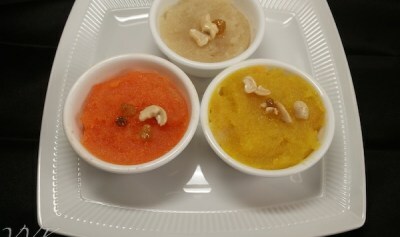 (This helps the kesari to be non-sticky) Make sure the sugar-water is in thin consistency. Once the water evaporates, turn off the heat. Elaichi, fruit essence and edible food colors are completely optional.